The penultimate episode of the series, and the second small railway adaptation. 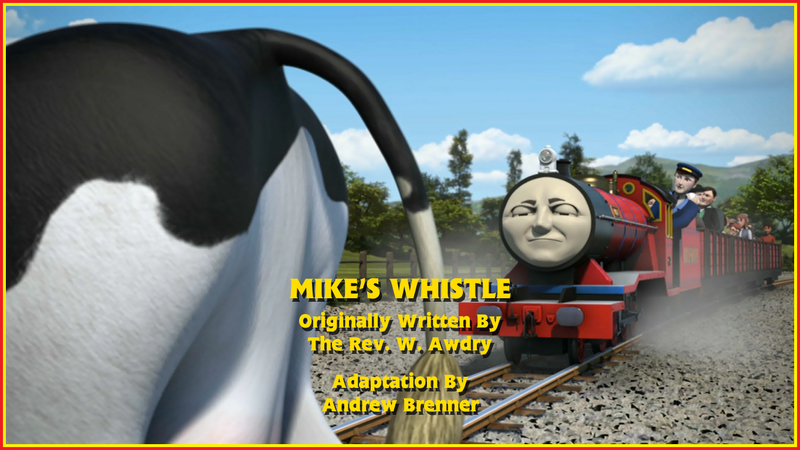 But will Mike's Whistle be as good, if not better, than its predecessor? It's rather strange that, technically, this is the second time this story has been adapted for television, the first time being Faulty Whistles in series 6, only with the characters changed. And while that was a good adaptation, this is a brilliant one. First off, it's much more entertaining. While I don't mention it too much any more, Thomas being away from his branch (in episodes) still irks me a bit. However, I absolutely loved him meeting the small engines here. His character actually felt right and he was the only engine (except maybe Percy) that could've pulled it off. Second, a whistle being blocked by eggs makes much more sense than one being knocked off an engine, running at low speed, by a low hanging branch, especially since there's no indication that the whistle was loose in the first place. It feels like there was more focus on an insignificant train than having Peter Sam's whistle problem - a key plot point - make sense. Yes, it's easy to say "But Mike's Whistle had more time! ", but it's up to the writers to use their specific time frames effectively. And I don't think Faulty Whistles did, at least the first minute of it. Third, I honestly prefer the teasing from Rex and Bert than Duncan simply being ignored. Both are great, and it's understandable that Duncan would be ignored, but since there are no other engines, besides Peter Sam, in the yard at that point, there's no one to ignore him. Meanwhile, Mike being teased by Rex and Bert plays into their dynamic really well, and it's much more fun to watch. Fourth, the ending plays out much better. Because Duncan still needs to get home without a whistle, he still has to take the organ with him... despite it being needed with the rest of the train at Strawberry Grove... apparently... even though the trucks end up getting dropped off at random places because who needs consistency in a story, am I right? With this adaptation though, the story is simple: Mike has to take passengers up and down the line, little things annoy him and the cow is the final straw, meaning passengers have to help him whistle to get home. It's consistent, easy to follow and while, yes, the pacing is still a bit slow, the characters do their best to keep things entertaining throughout, which they do really well. With the comparisons out of the way, what else does this adaptation do in its own right? Well, my first port of call is, surprisingly, Duck. He doesn't really get too much screen time, just a small role at the beginning and the end. But it's rather brilliant that they still managed to develop his character. If you take every episode before this into account, he's been... well, rather condescending. Not so much in a "Great Western Way or the Wrong Way", in your face fashion, but in a much more subtle "I'm trying to help, but I'm doing it in my own smug way" style. So you could see his incident here in two ways: it's either knocking him down a peg or two or it really was just a genuine mishap. But it's the end, when Mike returns without his whistle, where Duck really shines. Him saying "I know what that's like" was a great way of him showing that he is empathetic at times, which could help his character going forward. Or it could just be a throwaway line since he reverts to type soon after. That was a bit of a shame, but I guess character development doesn't happen instantly. Also, Mike's driver is probably the most entertaining of the three. It's probably down to the engine he has to work with, but he was great throughout, especially when the whistle cap flies off. The only niggle I have is that the ending seems... kind of elongated to fit the time. While they try and make the interactions between Rex, Bert and Thomas as entertaining as possible, they weren't really that necessary; they could've just had Rex and Bert tease him and things would've been fine. But it's not that big of an issue due to, as I say, the entertainment value. While Faulty Whistles was an OK adaptation, this is the definitive one. The story is better, it's funnier and, comparing the two storytelling styles, this current style is by far the superior one. Yes, the narrator telling the whole story had its charm in the day and the characters were still well written, but this style allows the characters a lot more freedom to let them drive the story without the narrator disrupting the pacing too much. While Faulty Whistles was a good adaptation and fitting for Duncan's character development, this was ten times better. I'm not sure if you're a Star Wars fan, but to me, this felt like the Empire Strikes Back of the Arlesdale trilogy. Out of all the three, which are all my favorites of the season, Mike's adventure was most entertaining to watch. It's funny and heartfelt from start to finish, and it leads on well from the previous episode.